Power fed into plants and machines often has to be distributed further to supply additional consumers, such as motors. Naturally, this process should be as secure and efficient as possible. But because we are using ever larger wire cross-sections and are striving to take up as little space as possible, the demands placed on distribution blocks are growing. Power distribution blocks from Weidmüller are used in all situations where power is supplied and distributed. Thanks to their high level of clarity and user-friendly design, they help you to implement a fast, efficient and space-saving power supply. In addition to the approval pursuant to IEC 60947-7-1, we also offer variants according to UL 1059 – for potential uses around the globe. Now you can manage multiple load connections and a wide range of wire sizes with Weidmüller’s Power Distribution blocks. By using the best materials and the best technology, Weidmüller provides the safest and most innovative connections available in a wide area of industrial applications, including; machinery, material handling, building/installation and power conditioning. 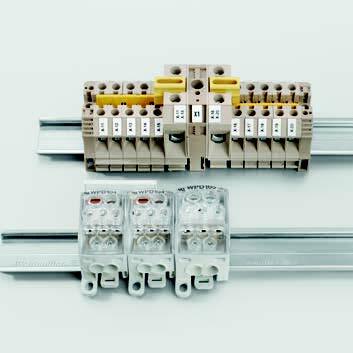 These DIN-rail mountable blocks combine installed cost savings over traditional methods, high short-circuit protection, and application flexibility. Weidmüller’s Power Distribution Blocks deliver power and performance – without compromising safety requirements.